Organizational Savvy: Political Tactics for Success. Despite excellent intentions, many corporate employees, managers, and executives are so narrowly focused on their own facts, logic, and task parts of their jobs that they lack broader strategic influence and impact. Assuming their “results will speak for themselves,” they may become the victims of behind-the-scenes power dynamics operating in their organizations. 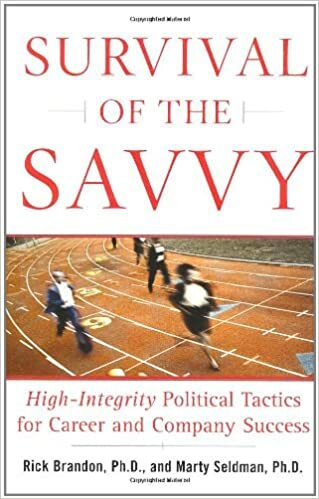 Based on the Wall Street Journal bestseller, Survival of the Savvy, this high-energy, intensive presentation adjusts attitudes about organizational politics and power dynamics, reframes politics as strategic influence, helps you to identify whether you are more or less political, over- or under-political, and orients you to proven skill sets for increased strategic influence. 1 – A Positive Politics Business Case – Understanding the origins of a leadership competency that wasn’t even on the map 20 years ago, but is now mission-critical. 3 – Organizational Savvy Skills – Identifying 13 vital strategies for navigating organizational politics with integrity through optional pre-work and overview by Rick. With 30 years of leadership development experience, Dr. Rick Brandon has taught tens of thousands. His global training firm, BRANDON PARTNERS, is headquartered in Mill Valley, CA and teaches the competencies of ethical political and organizational savvy at scores of Fortune 500 companies. Dr. Brandon wrote the Wall Street Journal bestseller, Survival of the Savvy, which was called “the definitive book on the competencies of organizational and political savvy” by Dr. Robert Eichinger, founder and author of Lominger’s Career Architect. Rick is on the distinguished faculty of the Institute for Management Studies and recognized thought leader on high-integrity politics within companies, and brings his humor-laced, upbeat speaking style to the Silicon Valley OD Network.